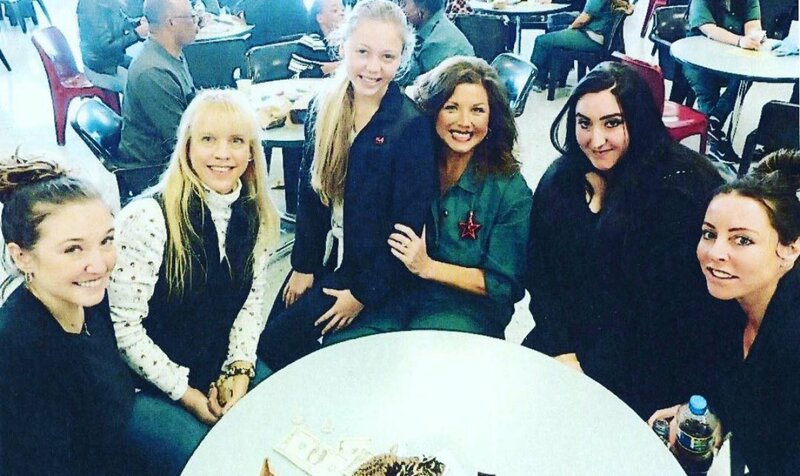 Abby, 51, posted a photo of herself Sunday on Instagram wearing a prison uniform and posing with other women appearing to be her visitors. Although a young girl was sitting on Abby's lap and blocking parts of her body, Abby's face and neck is noticeably thinner and more defined. Abby lost over 100 pounds while serving her time in the Federal Correctional Complex in Victorville, CA, according to Entertainment Tonight, as she underwent gastric bypass surgery in April 2017 prior to her sentencing -- a procedure that reduced her stomach by 80 percent. Abby captioned the photo featuring a slimmed-down version of herself, "Sometimes in life you make mistakes. I trusted the wrong people and didn't pay any attention to things I should of. I'm more than sorry for the mistakes I have made." The former reality TV star and dance instructor was sentenced in May 2017 to 366 days in federal prison followed by two years supervised release, People reported, and she reported to the facility in July of that year. Abby had pleaded guilty to bankruptcy fraud in Pittsburgh, PA, in June 2016. In addition to serving time, Abby had been fined $40,000 and was told to pay the $120,000 judgement. "My world flipped upside down when I had to enter prison," Abby continued in her Instagram post. "I did so with grace, the stories you read about me been a princess are untrue. I have made friends with both inmates and staff, I've tried to better myself, participated in anything offered to me and I am a better person for this experience." Abby was indicted in 2015 on 20 counts of bankruptcy fraud, false bankruptcy declarations and concealment of bankruptcy assets once the FBI, IRS, and postal inspectors conducted an investigation. Abby, who filed for bankruptcy in 2010, allegedly hid more than $755,000 in secret bank accounts between 2012 to 2013, when she was getting paid for multiple projects, including starring on Lifetime's Dance Moms and its spinoff Abby's Ultimate Dance Competition. Abby was also accused of not reporting over $100,000 in foreign currency that she brought from Australia into the United States in August 2014. Multiple news outlets have claimed Abby is on track to be released from prison within the next month or so; however, according to Abby herself, nothing is certain yet. "All the press stories and speculation are not entirely correct, however, I am feeling hopeful but no dates have been confirmed at this time," Abby concluded in her Sunday Instagram post. "I am feeling great and ready to turn over a new leaf thank you so much to everyone for your support especially my nearest and dearest I love you all (and yes this is me in prison). #abbyleemiller #abbylee #dancemoms #dance #aldc." Due to Abby's drastic weight loss, ET reported that she has already requested multiple surgeries for when she's released -- including a tummy tuck, excess skin removal, and breast lift.